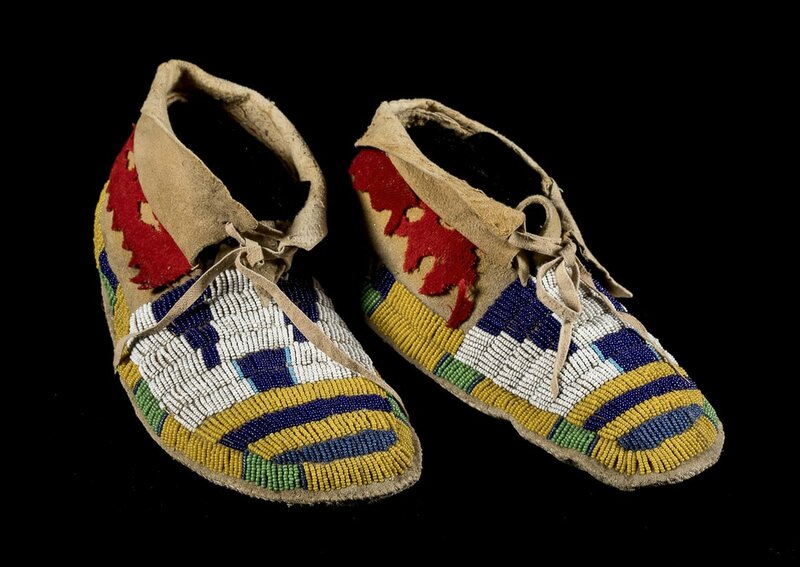 John Ewers, the noted ethnologist, once told me that moccasins were the single most collected item from the Plains Indians in the 19th century. The reasons for this are multiple and obvious: easy to transport and equally easy to relate to, the 19th century Indian moccasin in all its splendor was a sharp contrast to the dour black and brown clod kickers that the dominant culture wore. For the Native peoples, moccasins were not only an opportunity for adornment but also, like everything they wore, a sign of tribal identity. Within the parameters of tribal construction lay the opportunity for great variation in color and design. All of these examples stand out for their excellence in these areas within the context of their community and time. We hope you agree with Dr. Ewers and find these examples easy to relate to and a delight to view. This pair of late 19th century Comanche hi-tops moccasins painted with green and yellow ochre paint and heavily ornamented with german silver buttons was collected by Amos Gottschall near Cache River, OK. His distinctive tag with this information remains attached. This spectacular pair of Southern Cheyenne moccasins have a bold two colored blue background and a single row of tin cones down the center of the vamp. Typical Cheyenne construction, this row of cones is a distinguishing characteristic as well as the bold color format. This late 19th century pair of Delaware moccasins are in perfect condition except for some areas where the silk edging has deteriorated over time. The distinguishing characteristics of this pair include the beaded celestial elements on the cuffs and the maple leaf on the vamp, both of which are singular to this pair. These Seneca moccasins were collected by an English minister who was stationed in Western New York and returned to England in 1852. 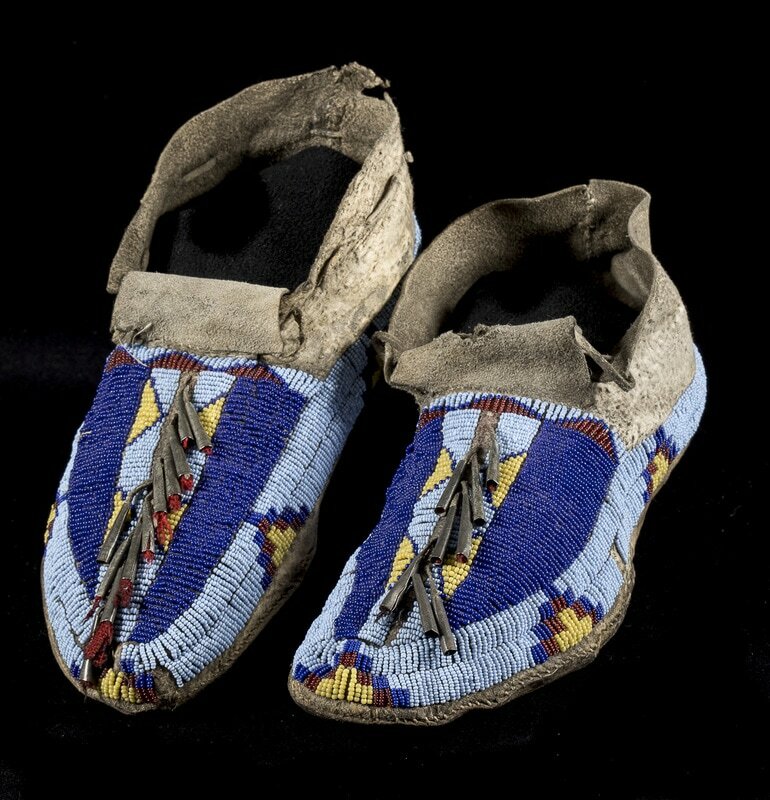 This superb pair of moccasins in spectacular condition were given to him in appreciation of the work he did among the people there. There is a tag attached that attests the the minister’s ownership. The Lakota moccasins circa 1875 - 1885 have classic colors with bifurcated tongues. The green panels on the vamps reference buffalo tracks and the ‘E’ element references animal tracks. The owner of these moccasins was walking on the same path as the buffalo and other animals. 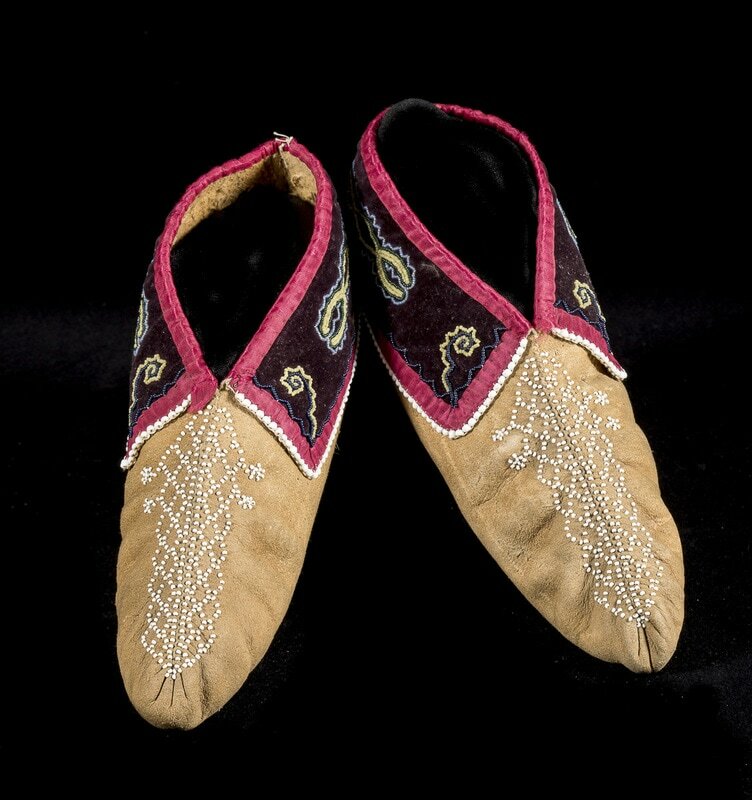 These Ute moccasins embody the distinctive beadwork aspects of Ute beadwork design - the use of single color bars in combination with a more typical tipi design with another shortened bar design spaced between the two. The use of color is also distinctively Ute and contrasts with the color usage of those tribes such as the Lakota who made many more examples.